Looking for a professional PowerPoint or Keynote presentation for your company? Or maybe you soon start an email campaign and need banners? We are also happy to create a practical webdesign for your new website. You are looking for a professional brochure or matching flyer? AltoAlto is always happy to help you out. We also provide total packages. In this way we customize each design to match the style of your company. AltoAlto is a graphic design agency that is happy to show you our work. Our experienced designers create each design in the most professional way. We are really looking for a design to be proud of. Thanks to our attention to detail we work any idea into a design to suit your wishes. Welcome! A professional PowerPoint or Keynote is a absolute musthave for a company that whishes to blow away their audience. 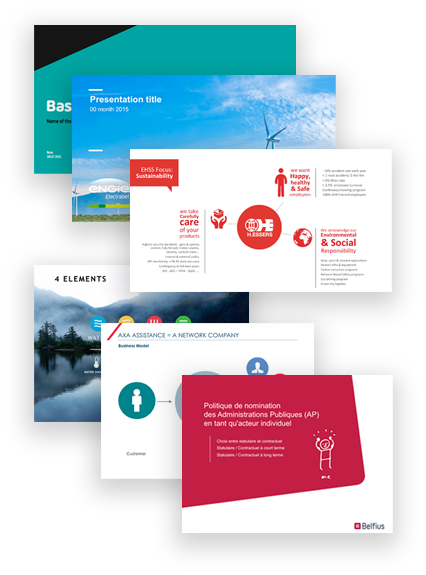 AltoAlto is happy to design a professional template for your corporate presentation. In this way we wrap our many years of experience into a beautifull and timeless design. AltoAlto creates all your printing within no time: posters, advertisment, brochures, logos, newsletters, magazines,… We design contemporary and professional designs of top quality. It is a pleasure to design your new website. Our graphic designers convert easily your ideas and wishes into a beautiful design. Introduce your potential clients to your services and products through a professional online webdesign. Your e-mail campaign is designed profesionally at AltoAlto. We are happy to design your professional newsletter, invitation,… Convince with an attractive design and get your message visually powerful. We also design different banners for your company. Static banners for your Google Display campaign, a flash banner campaign, wallpapers, social media banners and more! Take a look at our banners.